There is a lawnmower in my dining room. Why? Well, we have a garden and it does have a shed in it, but the shed is basically rotten and it doesn't have a lock on it. We had more of a meadow than a lawn, so the purchase of a lawnmower was pretty important. But where to put it? We did buy a lock for the shed (lawnmower thefts are a big deal round our way), but then realised our power drill required electricity so we couldn't fix it to the shed. We're still working out how to do that - might need to borrow a battery operated drill (or reeeeaaaaallly long extension lead) for that. In the mean time, I have a lawnmower in my dining room (grass, bugs and all), and a need to scour Pinterest for amazing shed solutions. Sheds are a huge deal at the moment, in case you hadn't noticed. And how much tidier would my house be if I had a shed to dump all my junk in (and tools, lots of garden tools!)? And so can you - check out this Pinterest board for all your shed inspiration. Follow Emily's board Garden Sheds on Pinterest. Once the lawnmower situation is resolved, we'll move on to the rest of the ridiculous clutter that we have hanging around the place. I'm starting to think it breeds when I'm not looking. Where am I supposed to keep all this stuff? We don't have a usable loft space, we don't have much by way of cupboards, we can't put shelves up and I have very little budget to invest in storage savvy furniture. So, if I suddenly stop blogging my way through May, please understand, it's probably because I've drowned under a pile of twelve-year-old bank statements or been killed by an avalanche of books. Does anyone else have this problem? What's a girl to do? Oh you definitely need a shed. Or two. 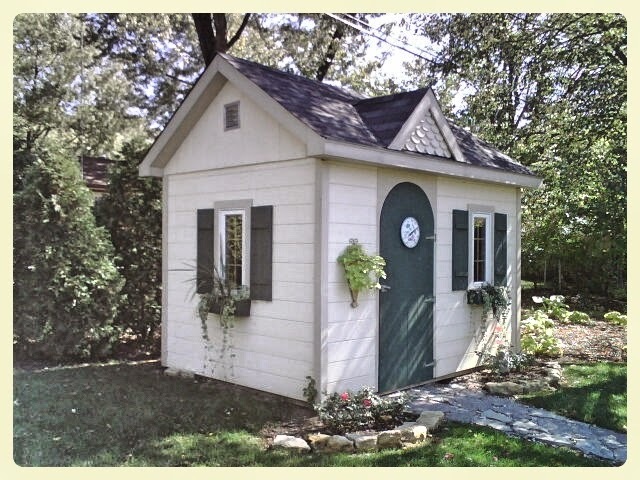 A his shed and a hers shed, because you'll need your own space outside too. MOH has the shed and I have the greenhouse and we each think we've got the best deal :) Good luck, and in the meantime try not to tread grass throughout the house!